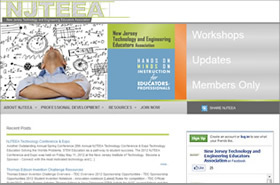 The New Jersey Technology and Engineering Educators Association content managed (CMS) website takes advantage of WordPress’s user-friendly dashboard — which is very important since the website is maintained by volunteers. The site offers both free (unprotected) content and premium content for its paid members. Membership is managed online via the s2Member plugin, which grants new registrants access once membership has been approved. In addition to password-protected content, the site streams social media feeds alongside it’s weblog.